Always Free & Quick online registration. No Purchases, minimums or obligations ever required! Is a Volunteer´s group of Friends and the “Friends Friends” shopping online thru CausesFunding.TEAM and is the base for donations and collect referral commissions. 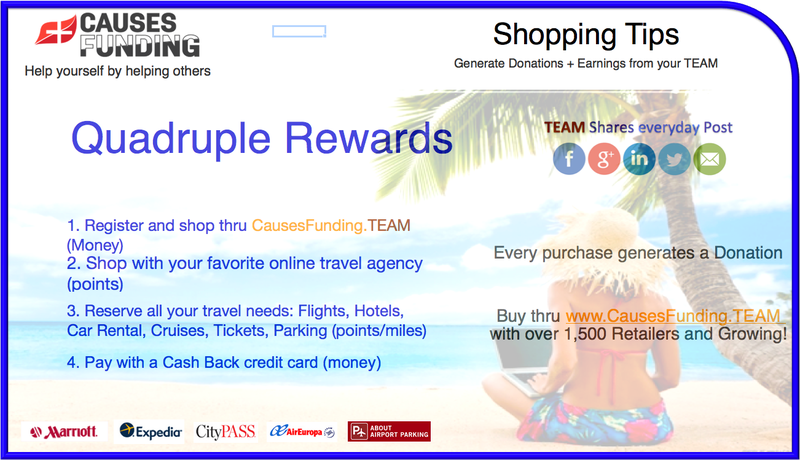 CausesFunding.TEAM is a double-sided rewards program inspired by “Giving/Get” referral commissions to Charities and your TEAM. I help my Friends that recommended me to earn commissions and the Friends that I recommended help me to gain. email your Friends with a set of predefined formats that you can customize to build and grow your TEAM and Commissions. Review your Commission from your “Friends Friends” and understand the power of your Networking effort. TEAM Builder Is a potent but straightforward tool that helps you create and control a permanent source of income referring your Friends and Family to CausesFunding.TEAM thru the publication of Posts in your Social Media Pages and sending invitation emails to friends and family! You Growth your TEAM with endless ideas of Volunteers Sources. Help yourself by helping others! You only need to be a Volunteer (at No Cost) to publish, and the system recognizes that you invite them to become Volunteers thru an ID code in your Short Link. Once they become Volunteers start purchasing from Top Retailers, you will receive commissions from your Friends plus your “Friends Friends” transactions. Imagine how many Volunteers can be part of your TEAM with a small effort. My Account Dashboard allows Volunteers to track the status of their Friends referrals, which makes it fun rather than tedious. A step by step process, techniques, and tips to grow your TEAM and generate passive income for lifetime enjoyment. Refers to techniques that target potential Volunteers to spread CausesFunding.TEAM awareness and promote donations. Establish a social media presence on major platforms. Share everyday Posts. Almost every person can be a CausesFunding.TEAM Volunteer and create a TEAM. Massive Sources include Charities, Public Figures, Press / Media, Bloggers, Universities, Alumni Associations, Fundraisers, Clubs, Companies and Labor Unions. Special mention to War Veterans, Special Needs Individuals, Senior Citizens, Financially Stressed people, Single Parents, and Teens. All they can be access massively access thru related Charities. 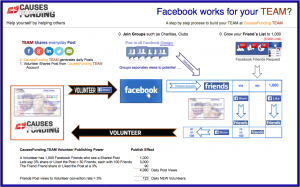 Specific: Identified the Social channel (Facebook) and a metric (Friends). Measurable: Friends (Double the Average for my age in “Challenge 100”). 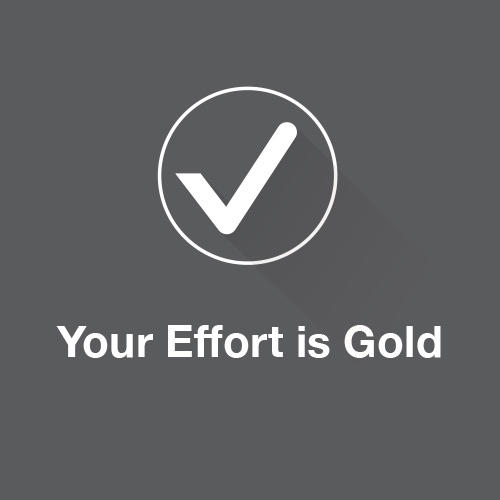 Achievable: We classify the difficulty to reach your Goal (Low). Relevant: Our goal will have an impact on our TEAM Growth. Time-Limit: The goal has to be met by the end of each Challenge (21 days). 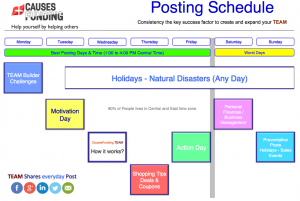 Everyday communications with actual and potential Volunteers will grow your TEAM and promote donations thru online shopping with Top retailers. 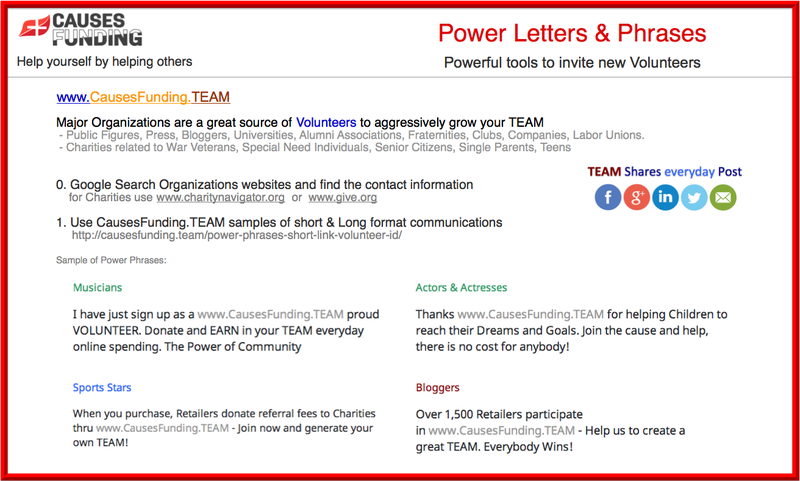 CausesFunding.TEAM generates marketing materials daily to attract new volunteers. 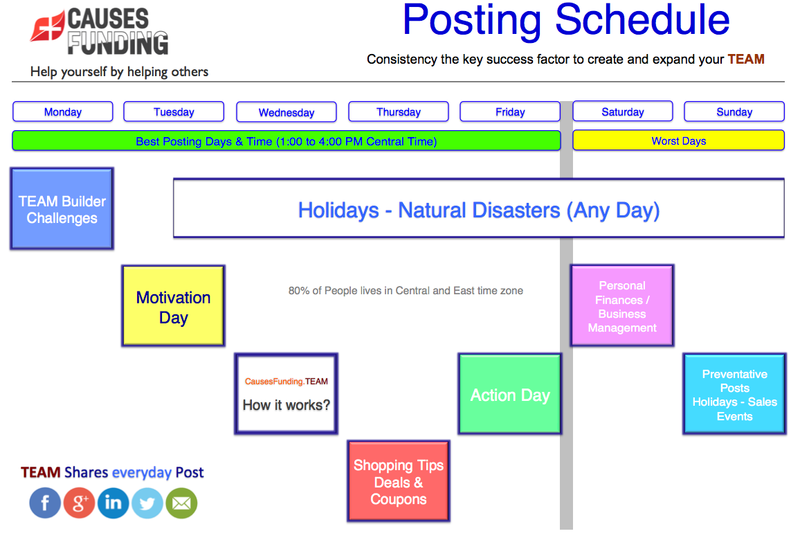 Post Types such as Motivational, Shopping Tips & Deals, How it works?, Holidays (high seasons online purchases), Natural Disasters (people more open to donating), Personal Finances / Business Management. 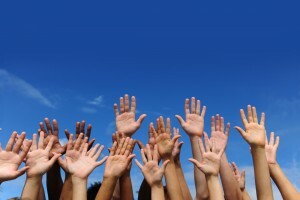 Become a Volunteer and start helping, generating the Power of Community! I. 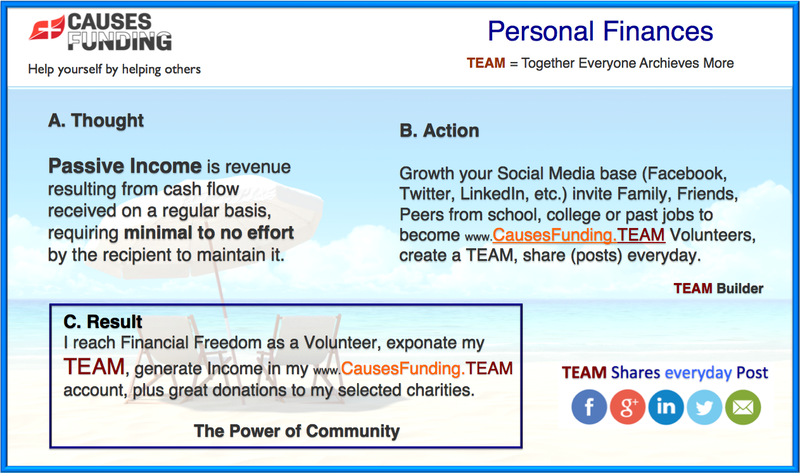 Volunteers join CausesFunding.TEAM Free to help Charities & generate Passive Income for them and their TEAM. II. 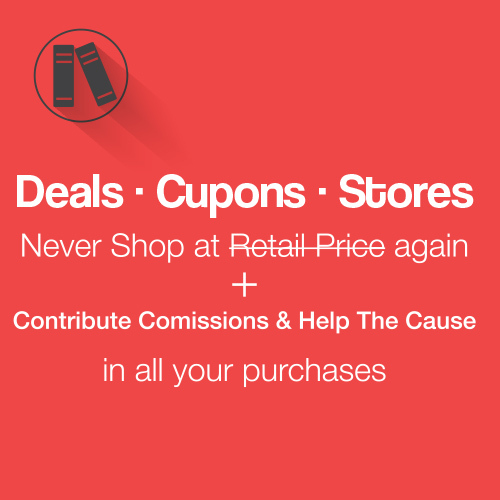 Top Retailers (1,500+) pay Referral Fees to CausesFunding.TEAM for purchases online and also for Deals & Coupons (Savings over Savings). III. CausesFunding.TEAM split net benefits after expenses between Charities (50%) & You and your TEAM (50%). TEAM Builder – Challenges are a step by step process to grow Volunteers in your TEAM and become a true Influencer Volunteer using Social Media. VI. No Investment or purchase required at any time (Avoid anything that needs you to pay them first). VII. 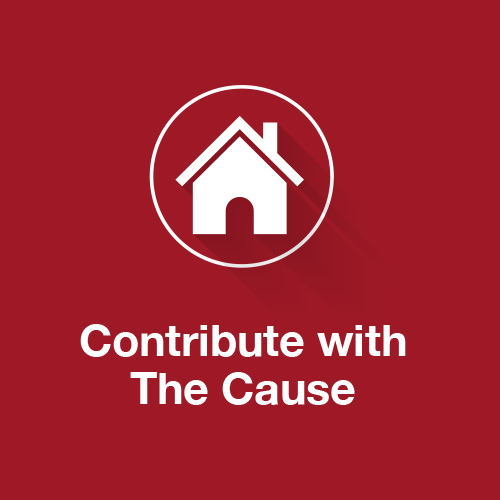 Who can participate and become a CausesFunding.TEAM Volunteer? Almost anyone! To help 6,000 Charities & 2 million people (Volunteers) worldwide to generate donations, passive income & improve their financial situation by 2020. 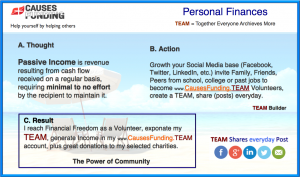 We share Referral Commissions with Charities, you and your TEAM. We will never sell Products or Services. The volunteers’ earned money deposited in a bank account. You have a detailed statement of your earnings at all times. You can withdraw your money at any time (minimum apply). We will credit your commissions as soon as we receive them. There is a detailed explanation of our relationship. We respect your Privacy and safeguard your Information. Always offer a written explanation that you can easily understand. We Respond to your questions as soon as possible. We help Entrepreneurs (Volunteers) to Start their Online business. Please read the Terms & Conditions and Volunteer Agreement to understand your rights & obligations. Start your own online business at CausesFunding.TEAM! 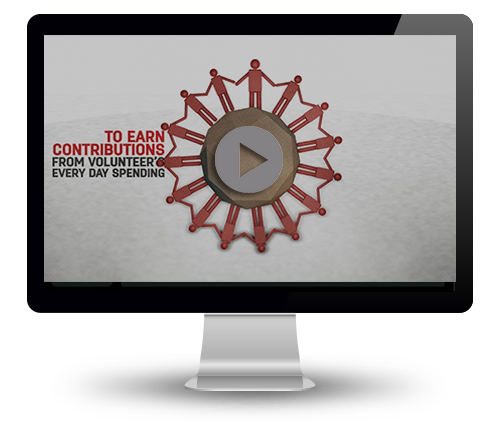 Create and grow your TEAM to develop a Financially Stable Life! What can CausesFunding.TEAM do/be for you? C. Have a lifelong Job! The Business Opportunity is simple; Top Retailers sell Products & Services, promote Deals & Coupons, online shopping is the new reality and Companies pay Referral Fees to gain and retain customers. Volunteers refer CausesFunding.TEAM to friends and promote mainly thru Social Media sharing to create a TEAM. We help Charities with Donations (50%), and ourself´s part of the collected money (50%). A TEAM is a group of my friends and their “friends friends” that share benefits. My Title: Volunteer or Influencer Volunteer and/or Professional Fundraiser (you pick it!) and use it in your Corporate Image (Business Cards & email). What is an “Online Referral” business? You get paid a referral commission just for sending people to websites (Retailers) that pay affiliate fees once a sale finished. The vendor does all the selling, fulfills the order and handles any customer service issues, CausesFunding.TEAM Volunteers collect commissions …not bad! * Generate extra money with your CausesFunding.TEAM Entrepreneurs Model based on “Online Referral & Marketing” with a minimal amount of time and effort (No Money to invest). *You need limited access to an internet connection; we provide all the infrastructure to develop your online business. * You do not need to be a Tech Whiz! * People go online looking for information and purchasing all kind of things, and you could be one of the many CausesFunding.TEAM is cashing in. * You do not need an Office, employees, or any overhead, just a computer or phone. The largest online Marketplaces will be part of your CausesFunding.TEAM Online Business. We are talking about eBay, Groupon, Amazon, Apple, Overstock, Walmart, Target, Bestbuy, and thousands of top retailers and brands. 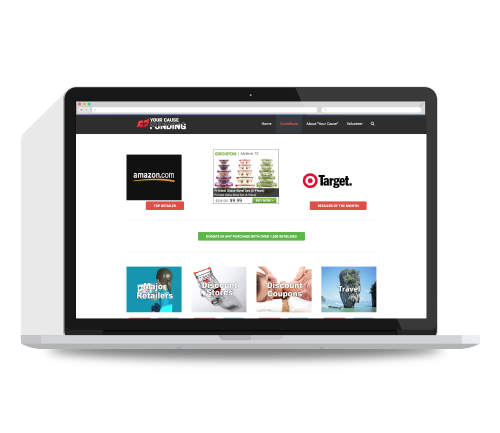 While you may dislike some of the Retailers your business is to Refer your TEAM members to ALL kind of websites and all your TEAM will receive commissions. If you want to create a business that doesn’t require tons of time and effort, you need to leverage your Network Relations (Friends & Family) that can be worth a lifetime revenue. A.1. What are we NOT? It is essential for you to know that we are NOT a Direct Sales or Multilevel Marketing Company. A.2. What do CausesFunding.TEAM sells? A.4. Who could join CausesFunding.TEAM as Volunteer? Pretty much anyone can enter the Program. A.5. What are the Costs to join the Program? NONE, sign up and if you want, recommend Friends. NONE, become a member and you will see it! NO, you never have to buy or pay for nothing. A.8. Give me five words that describe CausesFunding.TEAM? Fun, Easy, Money, Donations & Powerful. A.9. What should I do to understand CausesFunding.TEAM fully.? Navigate the main menu options and related pages. B.1. How are Referral Fees Distributed? 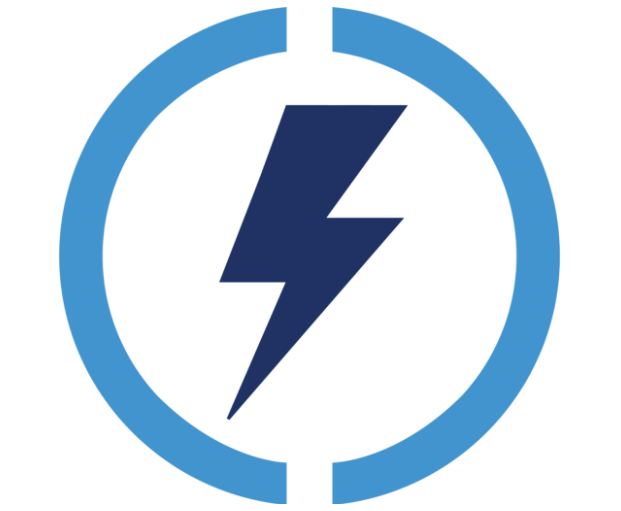 – Charities 40% (up to 5 and Volunteer define % for each one). B.2. Can I withdraw my money at any time? Yes, but you need to accumulate 250 Dollars, because of transfer costs. B.3. What is a Referral Sales Commission? Fees paid by advertisers (retailers) to CausesFunding.TEAM for Volunteers purchases. B.4. How will I be compensated? 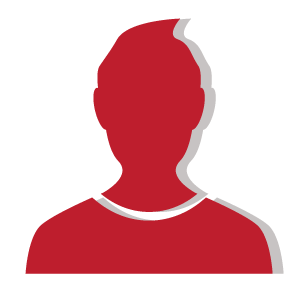 You collect from the Purchases Referral Commissions as well as the Commissions of your recruits and your recruits’ recruits. B.5. How much can you make? B.6. Is it worth to apply to CausesFunding.TEAM? It’s important to realize that 93 percent of Volunteers work from home, under 2 hours a week with no costs. B.7. For how long I will receive my Commissions? Permanently and they can be transferred to anyone you decide. C.1. What is my commitment to CausesFunding.TEAM? Very Limited; You can set your hours, taking time off for any reason at any time and continue earning. C.2. Am I prepared to put the time and effort into achieving my goal? 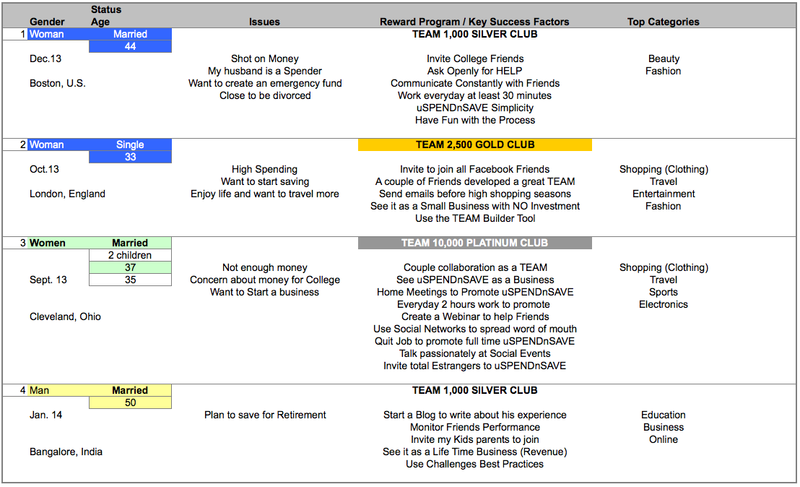 A detailed plan can access at TEAM Builder – Challenges. C.3. Is there an age limit for being a member? C.4. 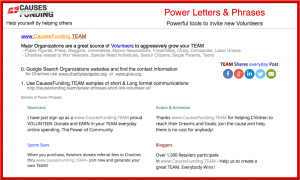 Do CausesFunding.TEAM offers something special for Volunteers (Members)? Volunteers have the potential of scoring a significant revenue if they access public figures, alumni associations, senior citizens, charities and other sources of massive Volunteers reach. C.5. Is CausesFunding.TEAM related to any “Pyramid Schemes“? No, and unfortunately are companies structured with the intent of defrauding the public selling Miracle Products as Starter Kits. C.6. Is there a Rewards Program? Yes, the base is the number of Volunteer (Friends and Friends of Friends) that you recommend. C.7. What is the Profile of the Top performing members? Women in their 40s & 50s are the best. Well educated members who understand the potential earnings. Active community volunteers will help others, and couples that work together are motivated to reach Challenges. C.8. 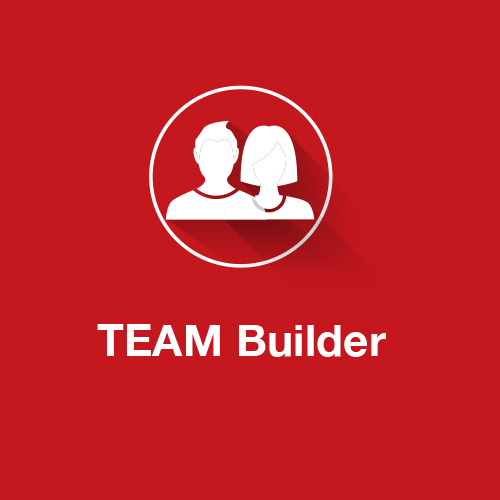 What is TEAM Builder Tool? A simple tool to Refer Friends and manage information and progress. C.9. What is a Challenge? A guided program to reach a certain number of Volunteers (Friends + “Friends Friends”), when you reach the goal. D.1. CausesFunding.TEAM could be a Family Business? It is just a matter of your commitment to developing a TEAM and Sharing everyday Posts. D.2. How do you help me to succeed? CausesFunding.TEAM is based on Challenges to reach your goals. TEAM Builder is a great way to measure progress. D.3. What is the Probability to be Successful? It all depends on your commitment and consistency to Share Posts and grow and manage your TEAM. D.4. Do I have to promote Products one on one or home parties? No, you need to Share Posts with Friends thru the TEAM Builder Tool. D.5. Is there any possibility that I lose money in CausesFunding.TEAM? No way! There are no upfront fees or inventory purchases. D.6. How can I be successful? While there’s no formula for determining how many hours you must commit to generating a substantial income, To earn the equivalent of a full-time salary, you have to work full-time. Even then, you must allow time to build your TEAM base. D.7. I am shy and feel uneasy asking friends and family to join the program? You will invite them to join thru Sharing interesting Posts; it´s not an invasive process. D.8. Do I have to attend Training programs or handle paperwork? NO, You only have to input names and emails in the TEAM Builder Tool. D.9. It sounds too good to be true? Yes, since it is free the only way to know if it´s true is to try it. D.10. What is NEE (Networking Exponential Effect)? A TEAM building principle based on referring friends and family to become members. The same law that use Mark Zuckerberg to develop Facebook members. How to Start your Online Business for Free? - Just Register!